Grey Skies For New Years Travellers? Dean Nicholas Grey Skies For New Years Travellers? 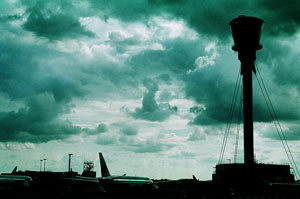 We feel churlish bringing it up again, but not so long ago Heathrow was voted the world's least favourite airport. As we head into the crunch Christmas travel period, it could surely use a slice of decent press. So is there any good news to come out of TW19? Is there 'eck. Word reaches us that key workers at Heathrow are to be balloted for a strike. The Unite union has asked the airport's firefighters, security, maintenance and clerical staff to decide whether they want to walk out due to a row over guaranteed pension schemes. The result is set to for December 20th, with any walkout happening on the 27th December at the earliest. Naturally, Londonist is cosying up within the comforting confines of the M25 over the festive season, but we can well imagine the carnage that a Christmas and New Year strike would cause for those trying to escape the city for warmer climes or returning from far-off familial homes. As we reported earlier this year, BAA already expects passengers to queue longer during peak travel times, and that's without factoring in a strike. Pensions may be important, but we don't imagine the timing of this proposed action will curry much favour amongst a public for whom London's airports are already synonymous with endless waits, screaming children and red-faced hotheads ranting at check-in clerks.